"If blue is your favorite color you love harmony, are reliable, sensitive and always make an effort to think of others. You like to keep things clean and tidy and feel that stability is the most important aspect in life." Yep. Except for the tidy sewing room, but I'm working on it. "Purple. You are artistic and unique. You have a great respect for people but at times can be arrogant." Also, yes. I would say self-contained and highly reserved, but I'm sure it comes across as arrogance to some people. I bet it wouldn't surprise anyone to hear me say that my favorite colors to work with are blue and purple. I feel those colors down to my bones and enjoy the cool visual breeze they blow into my mind. Blue and purple are the peace after a deep breath and I love breathing them in. I posted a picture of Babyness a month or so ago that perfectly captured one of her best features. In our family, we call them her little "elfy ears." At the very top, there is a whimsical flare out that is subtle and utterly charming. I tried to think of a way to caption this photo that would describe just how I felt about her. I finally settled on, "I love those little ears more than I love blue and purple." Succinct, and so very, very true. The real mystery was how she came to have "elfy ears." I don't have them. My husband doesn't have them. We didn't know of anyone on either side of our family who had them. I was digging through our family history books this week looking for something completely unrelated when I solved the mystery. A picture stopped me in my tracks. Her Scottish great-great-great-grandfather has the exact same ears. After that, I had to read all about him. Isaac had an incredible work ethic and through the course of his life became a man of considerable means. He was able to easily afford to help buy Mary, his mother-in-law, a nice home where she was able to support herself with her sewing skills. In fact, she was a seamstress of some renown and the prominent people of her town exclusively came to her for clothing. Later in her life she chose to remarry. According to family lore, the marriage lasted only one day. The day after the wedding, the groom's son showed up at her doorstep and asked Mary to make a new suit and vest for him. She threw him out. Later in the afternoon, the groom's daughter showed up asking Mary to make a new dress and matching coat for her. She threw her out, too. After being met by his distraught children on the way home from work, Mary's new husband appeared at the door where they exchanged heated words. "I didn't marry you to be a free seamstress for your family, I married you to be a wife." Having spoken her mind, she threw him out. He never came back and she didn't mind. I guess the point of that little side-trip down family history lane was that this quilt and my little girl's ears are now firmly linked in my mind! Also, I love them both. I started "Twilight Glitter Sparkles" (named by my other daughter) for the Pantone Quilt Challenge. At the time, it was entered in the Just the Top Category, where it won Viewer's Choice (yay!!). Over the summer it was quilted by my friend, Sarah Yoder Parker. I liked it well enough that I thought it could have it's own blog post. If you'd like to see the other Pantone quilts I made, the title of the post is Treasures. I am a great admirer of Nancy Crow. I'm not at the point of my life where a trip out to her barn for personalized instruction can happen, but I try to fill in the gaps by voraciously reading the blog posts of people that have gone. Somewhere in the course of that reading, I found a quote attributed to Nancy Crow by Kathie Kerler. I've really taken that advice to heart and made getting the values right one of my main goals in color selection. I used to have to take pictures of fabric with my phone and turn them into black and white to see the values, but I don't have to do that much anymore. As with anything, you get better with practice. I find that squinting at the fabric and/or the design wall helps me see the values better. Hopefully I'll outgrow that particular crutch soon, too. Otherwise I'm going to need some suggestions for a great eye cream! I included a black and white picture to show why value is just as important as color. 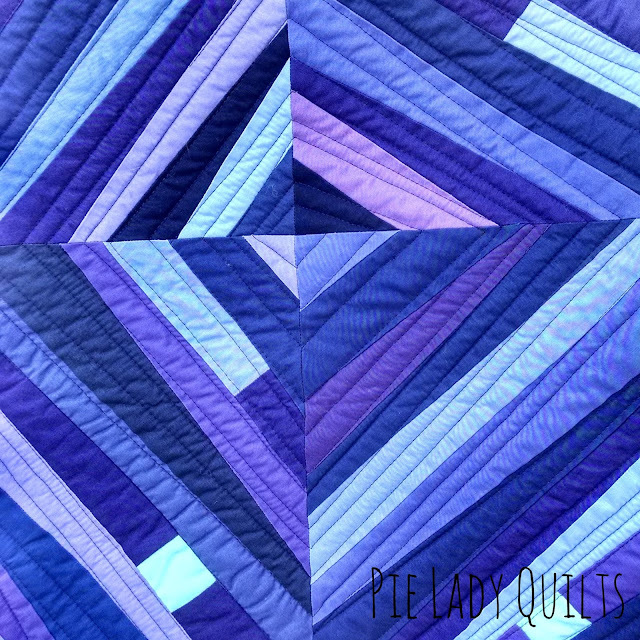 In the case of this quilt, it intensifies the movement that came from the piecing. "Twilight Glitter Sparkles" finishes at 48" x 69." Isaac and Eleanor. Eleanor was Mary's daughter. If you are visiting from the Blogger's Quilt Festival, welcome. Thanks for stopping by. A special thank you to Aunt Margie for sharing the pictures and stories with the rest of the family. I am so happy for the chance to get to know Isaac and Mary a little better. You certainly have value nailed. I think that is the single most thing that is wrong with a quilt. Mostly mediums is what I see too often. Great story! Thanks, Linda. Mediums are just so fun to buy, though!! I have to make a quilt for a friend with her favorite color purple. I really like your use of purple here. Great Job. Thank you, Nancy! I love purple in an analogous color scheme. Your friend and I are kindred spirits! I so enjoyed reading your blog! I usually take a b&w photo on my phone to determine if I have the right mix of values, it really does help in placement. Your quilt is perfect! Thanks, Sharon! The phone trick is such a good one. How did we ever survive without them?! Wonderful quilt, love how the slightly different values dance around! And I enjoyed reading your post too! Excellent post - I try to work more with values but it is definitely an area I struggle with on a technical level. Blue and purple are two of my go-to colors - soothing and calming but also lively and interesting. Enjoyed the family story, too. Thanks, Julie. The more fabric I collect the easier it gets. When I order, I don't just get the fabrics I like. The fabrics you like on the bolt are rarely the fabrics you NEED. Lovely quilt and such a great story! Congrats on Viewer's Choice, too! Thanks, Paige. I was thrilled that people voted for me and ecstatic to get a cone of thread!! Thanks, Karin. Blue and purple almost always look great together. Beautiful quilt - great colours and dynamic shapes. And the story about Mary is just a gem! Thanks, Lena! She's my kind of woman! I hope I can raise my girls to be just as tough! I love, love, love wonky! I wasn't going to read the long prelude to the quilt but I'm sure glad that I did! 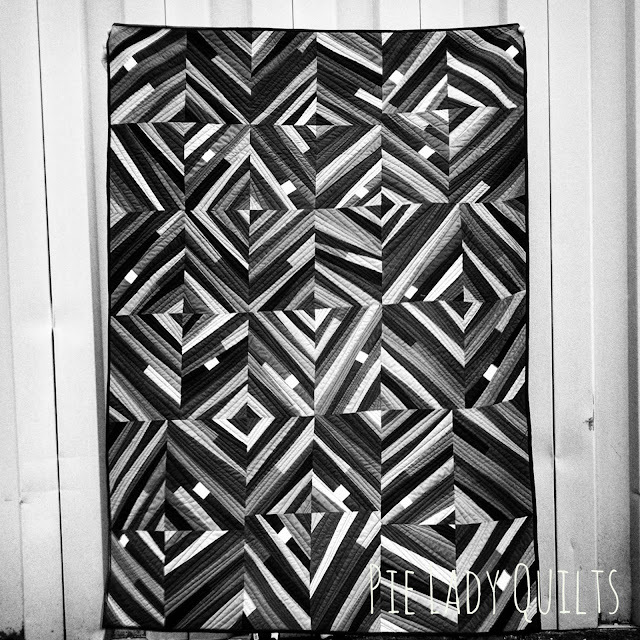 Fascinating story and your quilt is too. I too am guilty of choosing too many fabrics in the medium value range (perhaps because that's what hubby likes best), but then the problem always rears its head, how can I make this quilt pop? Thank you for reading! I try hard to write something compelling enough to slow down the race to the pictures. I think most quilters have a huge stash of mediums. It's fun to go shopping for those lights and darks, though! Well that was an interesting read - and evidence of why we still need blogs as well as Instagram. Thank you for the insights into blue and purple. They are my favourite colours too, and I also identify with the traits you listed above. Lovely quilt - as always. Thanks, Wendy! I agree about the need for blogs. I've got to admit that I'm worried, though. So much of the content and readership is shifting to IG. Wonderful quilt, and I love the story about your daughter's ears! You are so right about value. What a wonderfully graphic quilt you've created. AGAIN. Always a pleasure to come see your latest! Thanks, Audrey. I'm going to make an effort to be a better blogger. I'm starting to take all the pictures with my phone. So far, so good! Ah, so you like blue and purple? So do I especially in this quilt! The colors just sing and the little twinkly whites. Well, you know, perfect! I enjoyed the stories of your daughter's ears and (how many greats?) 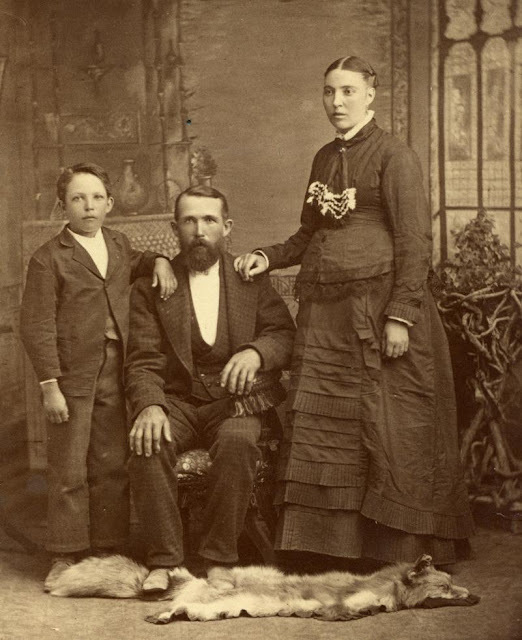 grandfather's family. Family stories are especially enjoyable when they go back so many years. How special that they have been saved all this time. Thank you, Mary! I've been blessed with a family that remembers. My dad's side has a great oral storytelling tradition and my mother's side has collected and written it. My mom told me just the other day that she has Eleanor's thimble and sewing scissors. What a treasure! This is such a spectacular quilt! It stops me in my tracks each time I have seen it posted. The family story is fabulous, too! Purple! I love the wonkiness and way you quilted it, too.